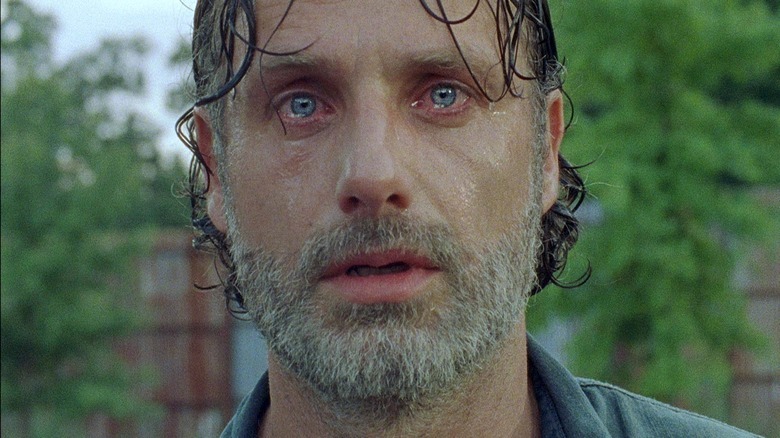 Saying goodbye to Andrew Lincoln's Rick Grimes on The Walking Dead is an inevitability, as the actor plans to shimmy out of the series' ninth season just six episodes in. What's less clear is the reason for Lincoln's departure. Sure, the actor briefly noted at San Diego Comic-Con 2018 that it's simply "time for [him] to go home," but is that genuinely all that's going on? Judging by what Lincoln recently told Entertainment Weekly, it is. The actor sat down with the outlet to discuss his impending Walking Dead exit, revealing that spending six months of the year away from his wife and children while shooting the series in Georgia started to take a toll on him. Ahead of season 9, Lincoln reached his breaking point and realized that now was the time to part ways with The Walking Dead. "I have two young children, and I live in a different country, and they become less portable as they get older. It was that simple," the England-based actor explained. "It was time for me to come home." Shooting his final episodes, Lincoln stated, was "like releasing air finally." The last two in which he appears were "very satisfying" to film, suggesting that something groundbreaking happens during Rick's swan song. But the episodes leading up to that arc will be rough to watch. "The world is deteriorating," Lincoln said of what goes down in season 9. "Rick Grimes has got a long game, and he knows that unless we trade, unless we look after each community, it's going to fall apart." Knowing Rick's final episode is fast approaching, viewers are probably clutching their hearts like so much so much zombie guts. But they should keep something important in mind: Lincoln leaving The Walking Dead doesn't mean he's leaving his character for good. The actor hinted at the possibility of appearing in other formats of Walking Dead-related media in stating he wanted to "clarify" that it's his "last season on the TV show" specifically. Plenty of television shows have continued on after their main actor dipped out, but the quality of the subsequent seasons hasn't always been stellar. Following Steve Carrell's exit from The Office, the sitcom didn't carry the same je ne sais quoi it did when Michael Scott and his obliviousness were front and center. Something similar happened with Topher Grace's departure from That '70s Show. However, series like Grey's Anatomy flourished even after a big name went missing from their roster. While some actors have suffered the death of their career after leaving their hit TV shows, we have a feeling Lincoln will be quite alright post-The Walking Dead. Hopefully the show can similarly thrive sans Rick Grimes. The Walking Dead will return to AMC for season 9 on October 7.